This is the future right now and it's not even 1983. There's no red/green outlines here, no the Asus VG236 23-inch LCD monitor represents 3D in all it's active-shutter glasses, Nvidia 3D Vision trim. Okay, 'future' might be pushing it a bit considering Nvidia has had stereoscopic drivers for years, and the test app is still the same spinning eye logo that's been in the driver set since the beginning. But still, you may have noted a certain effusive tone in my opening gambit that was entirely lacking from our previous looks at the world of 3D. And that's because we are finally seeing things coming together in a more coherent way, more so in fact than the supposedly burgeoning 3D cinematic experience. Partly that's down to smart, well-made displays such as the VG236 coming on the scene for a more reasonable price, but mostly because the drivers, and the way the hardware and software work together, is maturing. Discounting the 3D gubbins for a second, the VG236 is a great little monitor. It's sharp, clear, offers fantastic definition on colours and boasts an impressive viewing angle. Especially for a TN panel. The best part about it though is intrinsically linked to its 3D raison d'etre, namely that 120Hz refresh rate. But it's the 3D performance that really counts. Now that the driver sets and the games are maturing to an extent that 3D now does make a difference to the experience, a bundle like this is starting to be worth a look. Bizarrely the most impressive 3D game I've played has been the RTS RUSE. Its table-top battles are given a huge amount of depth thanks to the 3D effects, and despite the odd lost mouse pointer in 3D it was hugely disappointing going back to the traditional flat display. It really adds another level of immersion onto the game itself, and with other impressive titles such as Bad Company 2 and the awesome-looking Formula 1 from Codemasters, it's making a case for itself. 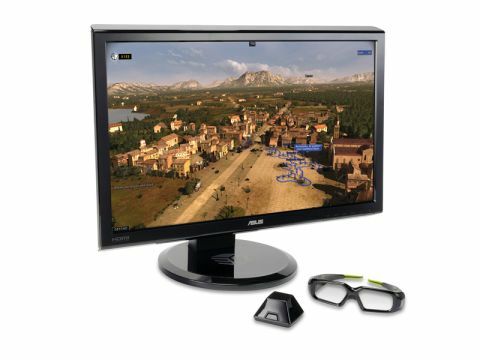 Now at nigh-on £400 for a 23-inch monitor it does still seem rather pricey to upgrade to a 3D monitor right now, but the saving grace here is that you're getting the full 3D vision kit in the box. That's still got a retail price of over a ton on its own, making the VG236 start to sound more appealing a proposition. Before you do rush out and drop the cash on a 3D monitor though, things still ain't perfect. There's still that initial discomfort when you first start using the glasses. You can recreate it for yourself by grabbing the nearest person with worse eyesight than you and borrowing their glasses for a minute. Uncomfortable, right? That stops after a fairly short while and it starts to feel natural. But even without 3D Vision the VG236 stands up as a quality monitor. It's a little chunky compared to some more stylish displays, but when the display's this good you won't be looking around the panel.